Take US Highway 280 or California Highway 101 south. Exit on California Highway 85 south. Exit on De Anza Blvd, and turn right (south). Continue until Reid Lane. Turn right on Reid. Stay left when the road splits. At the stop sign, turn left, and the church is in front of you. Take US Highway 880 South. Exit on California Highway 237 west. Exit on California Highway 85 south. Exit on De Anza Blvd, and turn right (south). Continue until Reid Lane. Turn right on Reid. Stay left when the road splits. At the stop sign, turn left, and the church is in front of you. Take California Highway 101 north. Exit on California Highway 85 north. Exit at Saratoga Avenue and turn left. Stay on Saratoga Avenue, and as you eneter the village of Saratoga, the street name becomes Big Basin Way. Follow Big Basin Way until 4th Street, and turn right. Follow 4th Street until Elva Avenue. Turn right on Elva. Look for the church at the end of the block. Services are held in English with some Slavonic and Greek. The parish follows the new calendar. 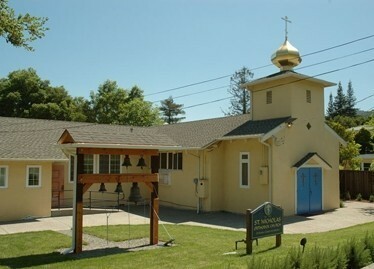 9:00 AM Divine Liturgy followed by lunch in the parish hall. Sunday School meets from September through Pascha. Confessions are heard on Saturday evening before Vigil/Vespers, before Sunday Divine Liturgy or by appointment with the rector.